Wayne, PA – AD Electrical hosted the 2017 AD Spring Network Meeting at the Hyatt Regency Indian Wells Resort from March 28th – March 30th, 2017. More than 220 attendees from 150 AD Independent Distributor companies from the US, Canada and Mexico attended this year’s event. Throughout the meeting, AD members networked and shared best practices in their structured networks of non-competing member companies, led by trained volunteer member facilitators. AD Networks are filled with smart and successful entrepreneurs who are ready to share their ideas for growth. 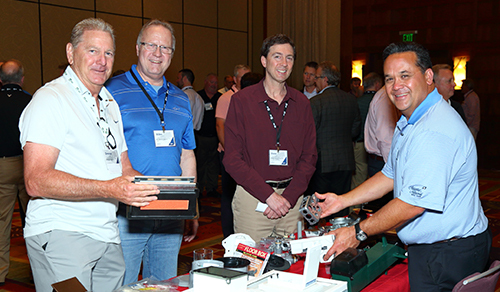 The highlights included a New Products Showcase that was exclusive to AD’s Silver Supplier Partners who shared with our members the latest products and solutions on the market, as well as an update at lunch from AD’s Chairman and CEO, Bill Weisberg. “eCommerce, people development services, channel convergence, and procurement services will help position you for growth,” stated Bill Weisberg during his address. To help our members stay ahead of the competition, AD provides a wide variety of innovative programs and services at affordable rates that are enabled by our multi-divisional model. The AD growth programs and services offered in the Electrical Division include: AD eCommerce Solutions; AD Rewards; AD energyFORCE; AD HR Services; AD Procurement Services; and AD Associate Member Program. For additional photos, please visit the AD Flickr Account by clicking here. AD is the largest contractor and industrial products wholesale buying group in North America. AD provides independent distributors and manufacturers of construction and industrial products with support and resources that accelerate growth. Our 550+ plus independently owned members span seven industries and three countries with annual sales in excess of $34 Billion. AD served industries include electrical, industrial, plumbing, PVF, HVAC, building materials, and bearings & power transmission. For more information visit: www.adhq.com. Mike Thompson, President, B.J. Electric Supplies Ltd.
David Borovsky, President, Bright Electric, Powered by Van Meter, Inc.